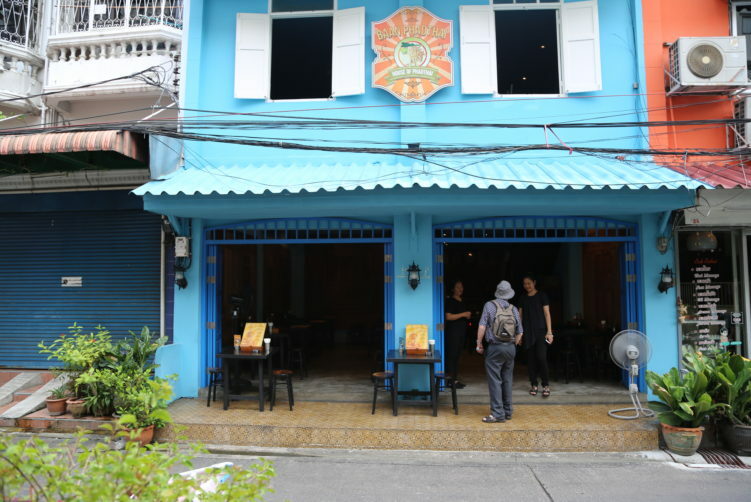 Baan Phadthai (The House of Phad Thai) in Soi 44 in Bang Rak has a charming, almost colonial style to it. Colors and interior makes a very pleasant harmony with a lovely atmosphere, especially when it is dark outside. The plates of Pad Thai is both good and bad, depending on your choice of protein. Their crab version of Pad Thai is inventive and good, but none of their versions makes it to my list of the 10 best Pad Thai spots in Bangkok. Fred Mayer deserves credit for creating an atmospheric and lovely dining spot. His portfolio also includes restaurants like Issaya Siamese Club, Kom Ba Wa and Pizza Massilia. All decent eating spots, like Baan Phadthai. Many of the houses in Soi 44 has a different look to it than most other Bangkok Soi’s. The wooden interior is from old traditional Thai Houses, but my thoughts are drifting off to a more colonial style with a hint of Mediterranean/Greece touch to it. The restaurant is close to both the Catholic Cathedral and the unfortunately abandoned old Customs House made by the Italian architect Joachim Grassi and built in the Palladian Style in 1888. Many Europeans settled down in this area due to increased trading the late 19th and early 20th century. 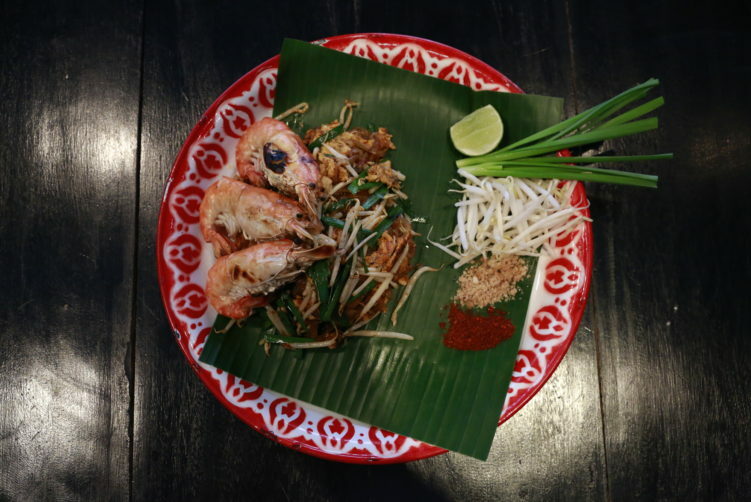 Baan Phadtahi doesn’t have much to do with an authentic version of pad (phad) thai. The main protein was tofu, with prawns being introduced later. Chicken and other meat alternatives is found in restaurants and stalls only trying to please a western crowd. They also serve a crab version, which I find quite an interesting innovation. That said, overloading a plate of Pad Thai with a palette of tastes might makes it easy to like, but harder to do great. Baan Phadthai is mixing a pretoria of tastes and ingredients in their tamarind based sauce, far more than I am able to recognize. The result is ingredients knocking each other out. The 18 ingredients is at least 12 to many. That said, the sauce is still on the charming side, but too sweet for my liking and far from being anything authentic. They use the 18 ingredients as a selling point, but this dish is actually about simplicity. A bigger problem are the prawns. The prawns are mushy, and not because they are fresh water prawns, but because they aren’t fresh. The texture is not even close to what you should expect when being billed 260 Bath. When I brought up the issue of the prawns, the person serving me blamed it on the time it took before they got the harvested prawns at the restaurant. Then she shifted her focus back to the ever present smart phone. If they can’t get quality prawns, they should of course stop serving them and recommend something else. I have tested the chicken version and the crab version before, both of them a better experience. The slightly bitter Chinese chives on the side, always served with pad thai, was especially welcoming as it was slightly on the sweet side. The astringent flower of the banana tree (hua plee) would have been a welcoming bitter addition, but that is not so common for spots catering for westerners. The lime is a must, adding neccesary tartness to the dish. The noodles, the bean sprouts etc. was all well treated. The dish is beautifully served on vintage style trays covered with banana leaf. You find the usual condiments on the table: roasted chili, fish sauce, sugar and crushed peanuts. The roasted chili and the fish sauce is a must use here. The sugar is a no-go as the pad thai already is on the sweet side. Pad thai is a typical one-dish meal (ahahn jahn diaw) and is not meant to accompany other dishes. Baan Phadthai is also serving several typical Isaan dishes, but as appetizers. 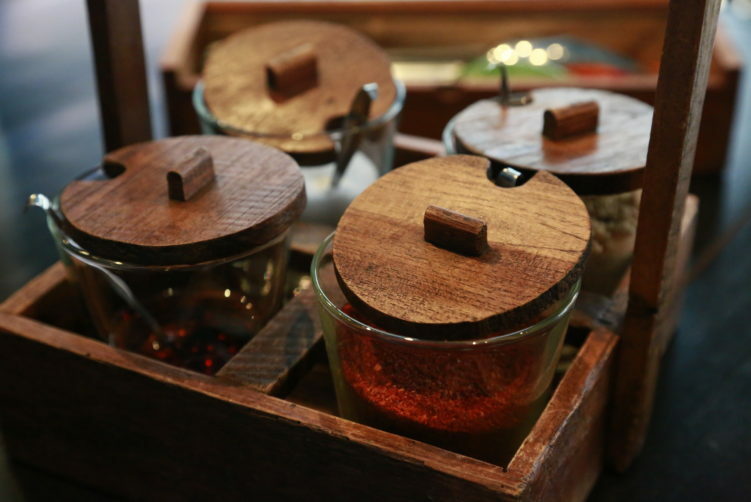 They are spiced down, and as they try to attract westerners, it’s probably not a bad idea. Pork skewers, som tam (papaya salad) and laab moo tod are some of the alternatives. They also have a good coconut ice cream for dessert. Baan Phadthai is directed towards tourists staying in the hotels along the riverside and has little to do with authentic Thai food. The prices are really high, on the border to a rip off when you know what you have to pay elsewhere. After all, and even with all it’s charm, Baan Phadthai is not an upscale version with air-condition and other comforting additions. Those trying to convince you that this is one of the best pad thai spots in the Big Mango is just occupying space in a fairy-tail. Most of my readers know I am bit disappointed of the street food coverage in the red guide, see my article on the Michelin Guide 2018 for more details. 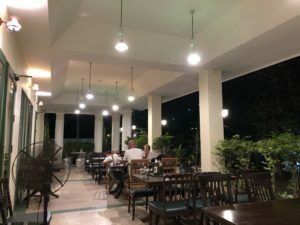 But when the guide calls the food at Baan PhadThai authentic and have awarded them a Bib Gourmand, meaning it is good value, that is just close to hilarious. order now Food: Different Issan inspired appetizers, different versions of pad thai and some desserts. How to get there: Take the BTS to Saphan Taksin and exit #3. Pass the temple on the left side and turn left, pass Robinson Shopping Mall and continue for about 100 meters, then take left into Soi 44. You find Baan Phadthai 100 meters into the Soi on the left side. You can also take the Chao Phraya express boat Sathon pier and walk from there. 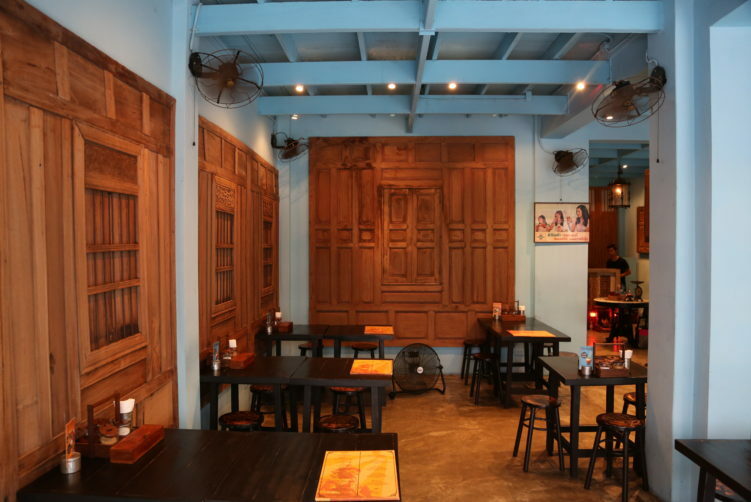 Baan Phadthai (The House of Phad Thai) in Soi 44 in Bang Rak has a charming, almost colonial style to it. The plates of Pad Thai is both good and bad, depending on your choice of protein. Their crab version of Pad Thai is inventive and good, but none of their versions makes it to my list of the 10 best Pad Thai spots in Bangkok. See full review at StreetsideBangkok.